GLORY 16 Denver is today. Yes, today. It will air live on Spike TV at 9PM Eastern time and is bound to be two hours chock full of action and excitement. To get you pumped up for tonight here is a look at the GLORY 16 Denver weigh-ins from yesterday. 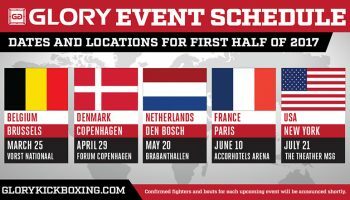 GLORY 16 will feature a one-night Heavyweight Contender tournament as well as crown a GLORY Welterweight Champion, all in one night, for free, on Spike!